Original made using mindmup.com. Would not recommend it. Pictures make the map too big, and you don’t know you’ve gone over the free-user size limit until you try to export/publish. The site also holds on to data, so even though you delete all the pictures/cut the map down it will tell you the size is too big. If you go over you have to start over. This is a stitched screencap of the original. I did another version on wisemapping.com which doesn’t allow pictures but does allow color-coding. You can share a version through the site which viewers can drag around to look at. Or export various ways–such as the pdf version below. Love these mindmaps. Thanks for the heads up mindmup, nothing can be for frustrating then reaching an unexpected limit. I like the fact that you’re able to use mindmeister within a google doc as an add-on. I was talking with a composition teacher and she said that she thought using the mindmap on a student essay really helped students understand hierarchy. 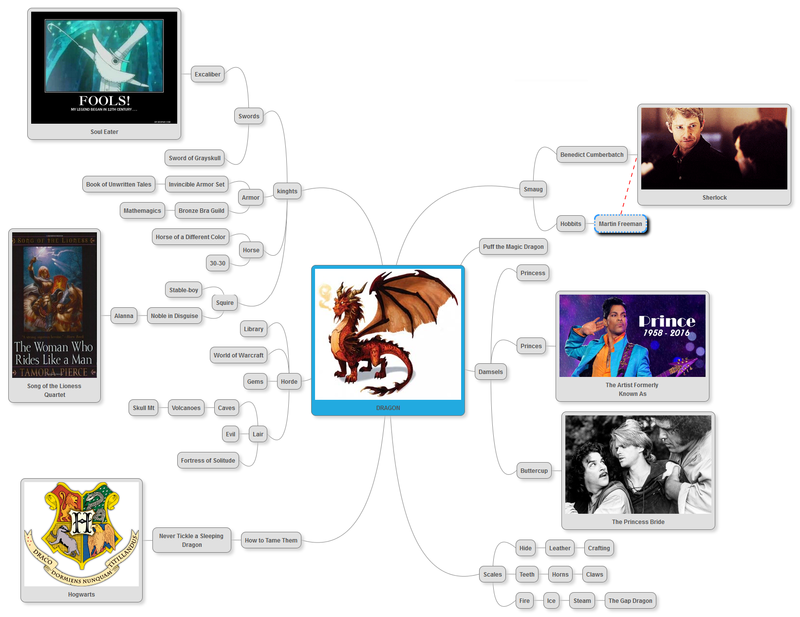 I think mindmaps are great for brainstorming writing. It takes some pressure off students to start informally. I saw a handmade, stuffed Smaug the other day. It was very cuddly.